Today, we’re welcoming author Jenny Torres Sanchez to the blog! Her YA books include Death, Dickinson, and the Demented Life of Frenchie Garcia, The Downside of Being Charlie, and (drumroll please) the newly released 2017 book Because of the Sun! Check out our interview with her below — and be sure to enter her giveaway for a copy of Because of the Sun! 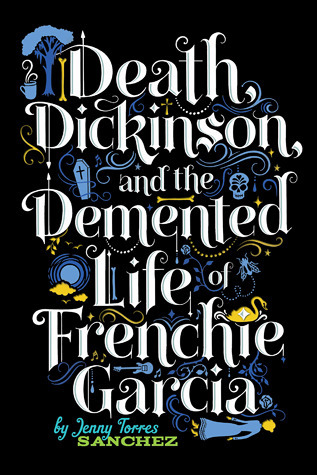 A few years back, I read Death, Dickinson, and the Demented Life of Frenchie Garcia — and I was blown away. I loved the way the issues of relationships and mortality were woven together with Emily Dickinson’s poetry. 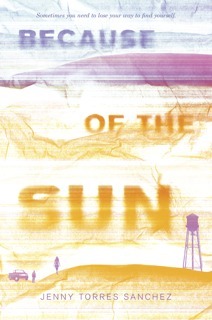 You’re including classic literature once again into your writing with Because of the Sun. What inspired you to take this path? I wrote an author’s note in the book this, about how Meursault was such a compelling and memorable character to me when I first read The Stranger. But I also just really love classic literature. In my high school English classes, we read a lot of classic literature and it always resulted in my teachers saying think about this, ponder this, what do you think? And when you’re used to parents telling you what to do and what to think, having the chance to really think for yourself and talk about and discuss the world and your opinions and different issues, just seemed so cool to me. I love the way literature lends itself to that. It’s not just about the story; it’s about the human condition. The discussions we had about various works in my English classes impacted me in such a way that has stuck with me my whole life, that inspired me to major in literature in college, and eventually also go on to teach it. Now I find it often makes its way into my writing. I think if I had to really break it down, I owe this love of literature to my English teachers. I was very lucky to have smart, open-minded, intelligent, inspiring English teachers. I just know that reading Because of the Sun will make me want to pick up The Stranger again for a reread. What would you say to a teen who’s having trouble relating to their classic literature reading for English class? I’d say, don’t feel like you have to understand all of it at once. And don’t be afraid of it. Classic literature can be a little intimidating. You think if I don’t get this, maybe I’m not smart. I still feel that way. But it’s just because language and styles change and what we see in classic lit is the language and style of another time. It can be a little unfamiliar at first, but the core of who we are as a people, the human experience, is covered beautifully in classic lit and it’s worth the struggle you might feel at first. Keep picking it up, don’t be hard on yourself, get what you can from it and think about it. It might just be a sentence sometimes, but sometimes that sentence will stick with you for some reason. Given the advice of “write what you know,” how much of your writing is about what you know? How much (or how little) of yourself did you put into your books? Well, writing, it’s a very personal thing. And I do feel like there’s probably a lot of me in my books, even when I work hard for there not to be. I really try to get into my characters’ heads and see the world through their eyes with their past experiences. I try to let them be themselves, but then, ultimately I’m the one interpreting all of that with my own thoughts and experiences so, you know, I’m kind of always there. Sometimes when I’m writing a book, the stress my characters are going through kind of bleeds over into my real life and I find myself feeling stressed and I realize, oh…it’s because such and such character is going through this. Anyway, it’s kind of strange because yeah, it’s this made up story, but I do see some of myself in it. Sometimes just barely, and other times more so. Going off of that… The setting feels incredibly crucial to Because of the Sun, as the heroine Dani moves from Florida to New Mexico. What are your experiences with these places? The setting is very crucial, which is funny because when I first started writing this book, I didn’t know it would end up largely set in New Mexico. It starts off in Florida which is where I live. And the heat is unrelenting here pretty much all year round, but amazingly so in summer (which is when I started writing Because of the Sun). That summer heat can be a very hallucinatory kind of thing, with how blinding and scorching the sun is, and I find myself thinking about it a lot. Just how hot it is. It seems a silly thing to think about, but I do. So anyway, the sun was on my mind when I started writing this book (and bears because there were several encounters with bears in the headlines around that time) and it made sense to set it in Florida to start. But then when Dani’s mother dies and Dani is hollowed out, I just saw her somewhere else. Somewhere just as hot and feverish, but bare and isolated, like she felt. I was familiar with Columbus, New Mexico because my in-laws live there, and suddenly I saw Dani there. And I saw the connection with the sun and the heat from The Stranger because it’s an important element in Camus’ book. And it all just clicked. What do you hope readers will take away from your newest book? What are you most excited for them to discover? You know, life is unfair. It can be heartbreakingly cruel. There is no justifying the suffering some people go through simply because of circumstances beyond their control. And I am always astounded by a person’s will to survive. To endure and rise. I believe in that. I do. And I want others to take that away from reading this book. I’m excited for them to discover their own ability to survive. At Rich in Color, we’re always on the lookout for great books. Have you read anything lately that you would recommend? I just started Midnight Without a Moon by Linda Williams Jackson and I absolutely love it so far. It’s rich and beautiful and I was immediately pulled right into the story. And I recently finished My Name is Lucy Barton by Elizabeth Strout. It’s impressive for so many reasons, but particularly for how much story she packs in such a slim book, how much she can conjure up in the reader’s mind with just a few details. Pretty amazing. And there you have it! Enter the giveaway below for a copy of Because of the Sun! The giveaway ends January 31st, and is only open to USA mailing addresses. See terms and conditions for further details! Good luck! Loved Death, Dickinson and I have strong memories of reading The Stranger in HS (those images of the heat and sun), so am really looking forward to Because of the Sun. I loved Death, Dickinson, and the Demented Life of Frenchie Garcia. I’m always recommending it because it’s one of those gems I don’t think gets enough credit. I’m really looking forward to picking up Jenny Torres Sanchez’s new book!